This article is about the year 1492. For other uses, see 1492 (disambiguation). The year 1492 is considered to be a significant year in the history of the West, Europe, Christianity, Spain, and the New World, among others, because of the number of significant events to have taken place during it. Some of the events which propelled the year into Western consciousness, also listed below, include the completion of the Reconquista of Spain, Europe's discovery of the New World, and the expulsion of Jews from Spain. January 2 – Muhammad XII, last Moorish Emir of Granada, surrenders his city to the army of Ferdinand and Isabella. October 12 – Columbus reaches the Americas for Spain. January 2 – Fall of Granada: Muhammad XII, the last Emir of Granada, surrenders his city to the army of the Catholic Monarchs (Ferdinand II of Aragon and Isabella I of Castile) after a lengthy siege, ending the ten-year Granada War and the centuries-long Reconquista, and bringing an end to 780 years of Muslim control in Al-Andalus. January 6 – Ferdinand and Isabella enter into Granada. January 15 – Christopher Columbus meets Ferdinand and Isabella at the Alcázar de los Reyes Cristianos in Córdoba, Andalusia, and persuades them to support his Atlantic voyage intended to find a new route to the East Indies. January 16 – The first grammar of the Spanish language (Gramática de la lengua castellana) is presented to Queen Isabella I.
January 23 – The Pentateuch is first printed. March 31 – Ferdinand and Isabella sign the Alhambra Decree, expelling all Jews from Spain unless they convert to Roman Catholicism. 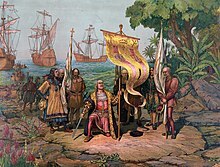 April 17 – The Capitulations of Santa Fe are signed between Christopher Columbus and the Crown of Castile, agreeing on arrangements for his forthcoming voyage. 8 June – Death of Elizabeth Woodville, the last living Yorkist queen. July 31 – The Jews are expelled from Spain; 40,000–200,000 leave. Sultan Bayezid II of the Ottoman Empire, learning of this, dispatches the Ottoman Navy to bring the Jews safely to Ottoman lands, mainly to the cities of Thessaloniki (in modern-day Greece) and İzmir (in modern-day Turkey). August 3 – The Genoese navigator Christopher Columbus sails with three ships from Palos de la Frontera, in the service of the Crown of Castile, on his first voyage across the Atlantic Ocean, intending to reach Asia. August 11 – Pope Alexander VI succeeds Pope Innocent VIII as the 214th pope, after the 1492 papal conclave, the first held in the Sistine Chapel. September 6 – Christoper Columbus sails from La Gomera in the Canary Islands, his final port of call before crossing the Atlantic Ocean for the first time. October 3 – English army besieges Boulogne. October 11 – Several members of the first voyage of Christopher Columbus witness an unusual light. October 12 – Christopher Columbus' expedition makes landfall in the Caribbean and lands on Guanahani, but he believes he has reached the East Indies. October 28 – Christopher Columbus lands in Cuba. November 3 – The Peace of Étaples is signed between England and France, ending French support for Perkin Warbeck, the pretender to the English throne. All English-held territory in France (with the exception of Calais) is returned to France. November 7 – The Ensisheim meteorite, a 127 kg (280 lb) meteorite, lands in a wheat field near the village of Ensisheim in Alsace. December 5 – Christopher Columbus becomes the first European to set foot on the island of Hispaniola. December 25 – Columbus' ship Santa María runs aground off Cap-Haïtien, and is lost. December 31 – About 100,000 Jews are expelled from Sicily. Antonio de Nebrija publishes Gramática de la lengua castellana, the first grammar text for the language of Castile, in Salamanca, which he introduces to Ferdinand and Isabella as "a tool of empire." Martin Behaim constructs the first surviving globe of Earth, the Erdapfel. As Columbus would only return from his voyage in 1493, this globe does not show the New World yet. Casimir IV Jagiellon, of the Jagiellon Royal House, ends his reign (1427–1492). The first arboretum to be designed and planted is the Arboretum Trsteno, near Dubrovnik in Croatia. Russians build the Ivangorod Fortress, on the eastern banks of the Narva River. In Ming Dynasty China, the commercial transportation of grain to the northern border, in exchange for salt certificates, is monetized. Ermysted's Grammar School, Skipton, North Yorkshire, is founded. Marsilio Ficino publishes his translation and commentary of Plotinus. ^ "La conquista de Granada por los Reyes Católicos". National Geographic. November 16, 2012. Retrieved October 26, 2018. ^ Brekelmans, Christianus; Saebo, Magne; Sæbø, Magne; Haran, Menahem; Fishbane, Michael A.; Ska, Jean Louis; Machinist, Peter (1996). Hebrew Bible / Old Testament: The History of Its Interpretation: II: From the Renaissance to the Enlightenment. Vandenhoeck & Ruprecht. p. 283. ISBN 9783525539828. ^ "Turkey Virtual Jewish History Tour". www.jewishvirtuallibrary.org. ^ Williams, Hywel (2005). Cassell's Chronology of World History. London: Weidenfeld & Nicolson. pp. 189–192. ISBN 0-304-35730-8. ^ Fryde, E. B (July 1, 1984). "Humanism and Renaissance Historiography". A&C Black. p. 122. ISBN 9780826427502. "1492". Timeline. USA: Digital Public Library of America. Archived from the original on June 6, 2014.